2016… Good bye and good riddance! To say that 2016 was not my best year ever would be a bit of an understatement. It seemed to be a year of challenges piled on top of calamities. I wont go into all the details. They really don’t deserve to see the light of day any more than they already have. The year wasn’t all bad though. I started a couple of projects that have been on my mind for a while. One of which is formal study. Never completing my studies when I was younger always haunted me. I’ve done OK without a degree but not completing one always felt like a personal failure. So, with a certain event earlier in the year reminding me that life is too short. I signed up to study for a Bachelors Degree! The other project is blog related. It’s a new site, with a narrow focus, where I’m applying what I’ve learned through this blog over the last two years. Like any new endeavour, there’s always a learning curve. Blogging is no different. There’ll be more on that project soon. Given the emotional roller coaster ride of 2016, my focus was completely scattered. As a result, I wasn’t able to achieve most of what I’d hoped to in 2016. Apart from September, when I didn’t post any new articles, I did manage to stick to a schedule of one post per week. That’s OK for maintaining the status quo but definitely not enough to drive the site’s expansion in any meaningful way. And, that’s OK… For the moment. Let me tell you, there was a lot of self criticism that went before that realisation! When life gets too challenging, and your energy is depleted, it’s OK to just focus on the really important stuff. You don’t have do it all. Really! Maintaining an average of 100,000 page views per month isn’t too shabby. I try not to compare my results with the sites that do over a million page views a month. It’s something to aspire to but other than that, comparison can undermine your confidence. So, any newbie bloggers out there, don’t get too caught up on what other’s are achieving with their blogs; run your own race. In the end, your blog needs to be something of which you’re proud. Click bait just annoys readers. And, annoyed readers don’t come back. Judging from this list, I think it’s safe to say simplifying your life and being smart with your money are still topics of importance for many folks out there (as well as for me). At the beginning of 2016, it was my plan to amp up the earnings from this site through affiliate earnings. Affiliate earnings are where I mention a product or service, like blog hosting or a book, and if you sign up or buy using that link, I make a small commission from the company, at no additional cost to you. This is another aspect of the blog that was sadly neglected in 2016. Affiliate sales amounted to little more than pocket money but given everything else, it was pocket money for which I was very grateful. These earnings are semi-passive as they’re not the result of a direct exchange of time for money. In your job or freelance business, if you don’t turn up to work or produce the product of your freelance contract, you don’t get paid. With semi-passive blog income, once the work is done, income is produced over and over again. It’s not entirely passive because you need to maintain momentum through regular new material and marketing but it’s not the same as getting paid just once for the work you do. 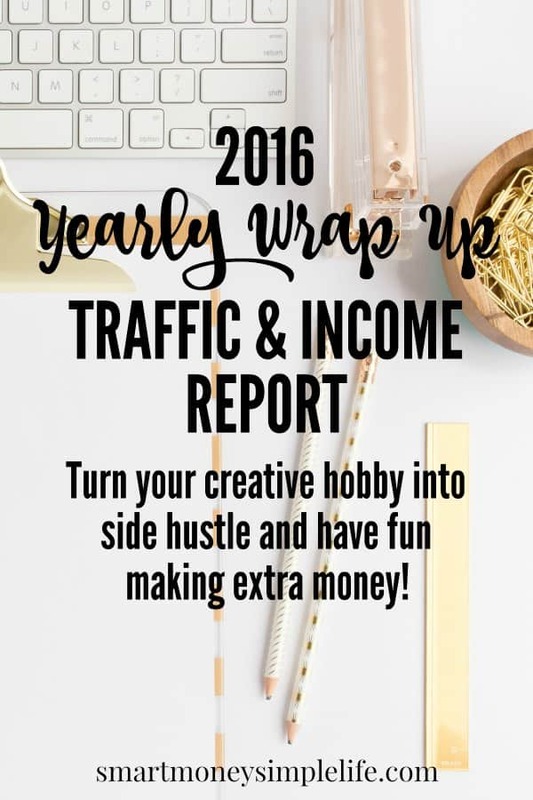 While passive and semi-passive income is the ultimate goal, this year I’ve added a Pinterest Service to my business income sources. If you need to outsource your Pinterest marketing, check out my offerings! In 2017, I’ll be sending a regular monthly newsletter in which I’ll share highlights from the blog and life in general. I’ve chosen to make it a monthly newsletter primarily because I hate being inundated with spammy emails every other day. I regularly unsubscribe from bloggers who send multiple emails per week that are all about selling something to their readers. I don’t like being bombarded with junk mail so I’ll never do it you. The newsletter will also include a list of the post published during the month so you’re always up to date. As mentioned above, I’m expanding my online business to include providing Pinterest marketing services. Pinterest has taken my blog from a few thousand page views per month to over 100,000 page views per month. I also have a Pinterest Quick Start Guide eBook in the works which will launch in February. Use the sign up form below to find out more about the Pinterest Quick Start Guide and be the first to get a copy of the free Pinterest Quick Tips as soon as it’s available. Along with the Pinterest Quick Start Guide, I’ll be publishing a frugal living guide which will help you create the kind of life you yearn for without giving up everything that makes today worthwhile. This one is still in the planning stages but should be available in June or July this year. I’m planning a new look for Smart Money, Simple Life in the coming months. A new template, maybe new colours… And hopefully faster. All things that will make using the site easier for you. Ultimately, my goal is to create a life and business that are successful and fulfilling. Part of that is financial, but a large part of that is being able to work on the stuff that interests me but also helps you. If what I’m doing isn’t helpful to you then regardless of whatever else is going on, it won’t be a success. So, my ultimate goal is about helping you achieve what you want to achieve. If I can help you do that, then I’ll probably be successful, too. Blogging is an extremely rewarding hobby and can be an extremely profitable business. If you’ve been thinking about starting your own blog, now is the time to start. Whether your interests lie in travel, carpentry or knitting, you can build a successful side hustle via a self-hosted blog on WordPress.org. It doesn’t cost a lot to start either, hosting can cost as little as a latte each month! What was 2016 like for you? Hopefully, it was awesome but either way, share your highlights (or low-lights) in the comments. Great results for 2016. I average about 20,000 PVs a month, so I’m behind you quite a bit there. I look forward to your Pinterest ebook. I’ve dabbled with Pinterest, but I haven;t taken it seriously yet. Maybe now is the time. Pinterest changed my world. Or at least my ‘blogging world’!